Tokyo 2020 Olympics and Paralympics are round the corner and we have already started our journey to Japan! Log your activity to earn points for your class team. Get Set Tokyo Click on the link to log your activity points for your team. Promoting a healthy lifestyle is vital to ensure our children remain fit and happy throughout their lives. All children can take part in sport, many children look up to sports stars and it is important that we all help children to be healthy and realise the importance of looking after their bodys. We are very lucky to have our coach deliver specialist PE lessons every week to our pupils. Children take part in a range of sports throughout the year. It is great to see children developing their skills and using these to consolidate their team work skills. Children in Year 5 and 6 also have swimming lessons - an important life skill. During our residential trips to PGL, children get to take part in a range of outdoor and adventurous activities - check out our Twitter (@CornthianCp) to see how much fun we had! Please make sure your child has their PE kit in school (White t shirt, black shorts and pumps) on the relevant days. At Corinthian we offer clubs in dodgeball, cross country, gymnastics, dance, football, judo, fencing, tennis, netball, archery and multi skills to name a few! These clubs are run by a range of teaching staff and specialised coaches ensuring children are recieving high quality coaching - we are very lucky to have so much on offer! We encourage all children at Corinthian to lead an active lifestyle and aim to offer clubs that everyone can find an interest in. Children are welcome to come along to any of our clubs for fun. We also enter into competitions that children can participate in, if they wish. These include: the Broadgreen League Football cup, Liverpool Schools Cross Country and Athletics, dodgeball matches with Y sports, judo competitions with JE Education and gymnastics and dance competition through Broadgreen International School and LEAP. Please look at the links below for further information. 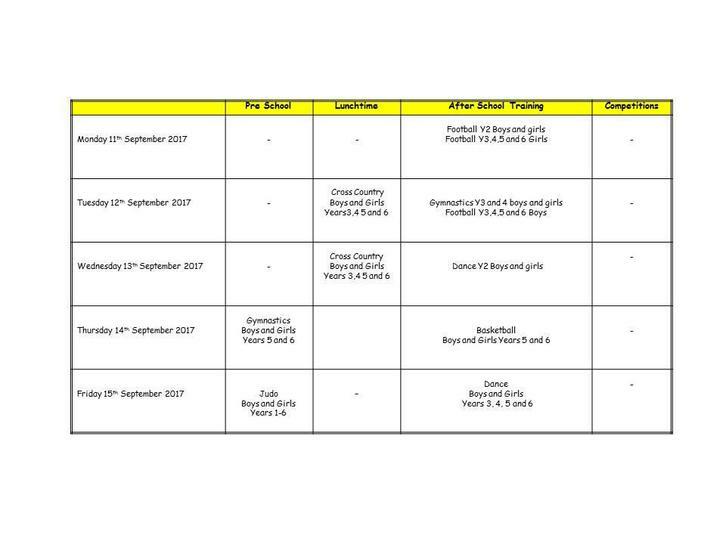 Below is an example of the sport clubs weekly timetable. These do change regularly! The timetables are displayed around school and posted on the school app weekly. Have a look and see what your child would like to take part in! LEAP gymnastics and dance Outside clubs and competitions.